Tune in to Live Constructions this Sunday, November 23, for the broadcast of a live set by electro-acoustic duo Lea et Leila. The duo is made up of Lea Bertucci on bass clarinet and Leila Bordreuil on cello, who perform improvised music through the use of extended techniques and experimental amplification. We captured one of their performances at ABC No Rio last month, and we will be airing the performance in its entirety tonight. Listen! 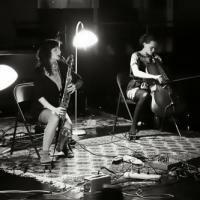 Lea Bertucci and Leila Bordreuil are a duo of electroacoustic Bass Clarinet and Cello. In active collaboration since 2013, they approach their instruments with radical re-imagination and technical innovation. Both instruments are amplified, but the use of electronic processing is kept to a minimum. Their varied palette of sound texture is generated from extended technique and a unique approach to amplification. Onde Souterraine represents their debut effort and was recorded in a church hall in Hudson NY, November of 2013.